Not even a power cut affecting half of Canterbury, including our venue, could dampen the energy of the attendees at last week’s Wellbeing Symposium. This year C3 was pleased to join with the Wellbeing People and Kent County Council in the Symposium partnership. 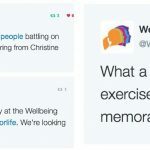 Annually, this event brings together wellbeing specialists and those interested in the wellbeing sector to discuss all aspects: community health, workplace wellbeing, government policy, and healthcare. One attendee remarked that this year’s was ‘the best I’ve been at’ and that he loved the energy and buzz in the room. You can see highlights from the day through a Twitter moment created by C3. The theme for the day quickly became apparent from the speakers’ presentations: making health everyone’sbusiness. C3’s director, Christine Hancock, comprehensively outlined the case for wellbeing in the keynote speech by providing evidence about why health and prevention is an investment, not a cost (and showing her nursing background, skilfully navigated the ‘emergency’ of a power cut midway through!). Headline speaker Christian van Stolk, RAND Europe, reinforced this message with evidence revealing the impact of staff health and wellbeing issues on productivity and subsequent costs for workplaces (almost £64 billion annually to the UK economy). In addition to the enormous cost of ill health, it’s just ‘plain preventable human misery’, as Roger Gough, Kent County Council cabinet member, pointed out in his synopsis of the morning. Although ill health is preventable, it requires a whole-of-society response. We can’t rely on public sector agencies to be able to do it on their own, nor on the NHS. Combating obesity: a partnership between Golding Homes and Wellbeing People, commissioned by Kent County Council, to bring health checks to hard to reach groups in the Maidstone Borough. Workplace health: Baker McKenzie reviewed the legal obligations for health and wellbeing and offered diverse examples of workplace health initiatives they’ve implemented with their own employees. Mental health: Change of Mind, helping people understand mental health issues through music. Engaging children in health: ‘Eddie and Friends’, an animated series for preschool children from the Hazlitt Theatre addressing hydration, nutrition and inclusivity. Healthy lifestyle service: Mytime Active described their ‘One You Walsall’ service that provides support in physical activity, healthy eating, emotional wellbeing and reducing smoking and drinking. Support for carers: Simplyhealth has launched Care for Life, a support network for those trying to balance unpaid care of a loved one with paid work. Hospital workplace health: KIMS Hospital provided a case study about how to achieve employee buy in for workplace health initiatives. Money is a significant factor in implementing these strategies. However, speakers noted that partnership working (another key element to C3’s approach) and reaching people imaginatively are also vital to success. There’s still much to be done and the need is urgent. But there are also organisations and individuals already out there with innovative programming (including those who won the inaugural Inspiring Wellbeing Awards). You can read more about the organisations featured at the Symposium and access speakers’ presentations on the Symposium website. We at C3 would also love to hear from you. Please contact us to learn more about our projects with communities, workplace health, businesses and more. And don’t forget to save the date for next year’s Symposium: 21 February 2018.